When I started this humble blog years ago who would have thought I would have nearly half a million people drop by to visit me and read my thoughts. Now that I have established a large following averaging 12-15K visitors monthly I would love to offer retailers & vendors a chance to advertise with me. The main banner ad 125 x 230 on our right navigation will soon be available at $100 monthly or $950 a year if interested. I will be adding no more than six 125 x 125 graphic ads for much less at $25 a month or $250 yearly. If interested in a something other than this or a creative partnership or sweepstakes please contact me at weddingnoise (at) gmail.com. Look forward to hearing from you. I just read a post about a 29 yr old man in Florida that tried to make his fiancee swallow her diamond engagement ring because she no longer wanted to live with him. Not only did he do this, he tried to do it while she had a 1 yr old in her arms at the time. 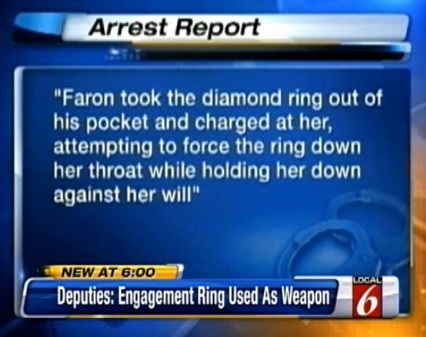 Using an engagement ring as a weapon? Let’s get to the heart of this. This “man”, according to this article, physically assaulted his fiance and tried to use an engagement ring as the weapon to choke her. He then has the audacity to say, “women always claim assault, but never accept responsibility for provoking someone,” according to deputies. You CAN NOT provoke someone to assault you and break the law. 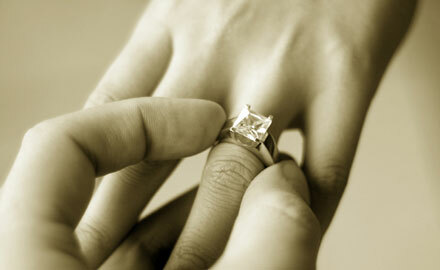 You CAN lose your temper and take out your anger inappropriately in a way that is considered domestic violence. Speaking of domestic violence in the home in front of children, I recently came across a comment from an organization titled “Children of Domestic Violence” that speaks on the impact of children just witnessing domestic violence. One surprising statistic they brought up was that 63% of all boys, age 11-20, who commit murder kill the man who was abusing their mother. These kind of statistics scare me and we must do something. We must stop men like this from perpetuating the cycle of violence and educate the children so they learn NOT to repeat what they see.